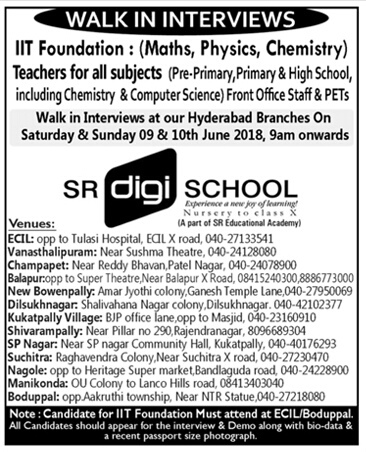 SR Digi School, Hyderabad has advertised in THE DECCAN CHRONICAL newspaper for recruitment of Pre Primary/Primary/High School Teachers/Non Teaching jobs vacancies. 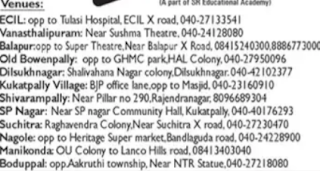 Interested and eligible job aspirants are requested to walk-in Saturday and sunday 09&10th June 2018.Check out further more details below. How to Apply: Walk-in Interviews at our Hyderabad Branches on Saturday & Sunday 9th&10th June 2018 from 9a.m onwards. 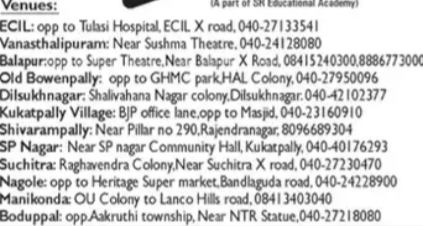 Reference: Advertisement on THE DECCAN CHRONICAL newspaper Dated 7th June 2018.